The Chase Sapphire Preferred® Card is a must-have credit card for any traveler who loves to dine out and reap high-rewards throughout the process. And now, new cardholders have the opportunity to claim the newly upgraded signup bonus: earn 60,000 bonus points, worth up to $750 in travel after you spend $4,000 on purchases in the first 3 months from account opening. Did you catch that? The signup bonus is worth up to $750! if you redeem your points through the Ultimate Rewards® portal; that's because Chase Sapphire Preferred® Card members' points are worth 25 percent more when redeem through the portal. For these reasons (and more!) the Chase Sapphire Preferred® Card is our 2019 CardRatings Editor's Choice pick for Best Travel Rewards Card. Increased signup bonus! Earn 60,000 bonus points after spending $4,000 in the first 3 months from account opening. That's worth $750 toward travel when you redeem through Chase Ultimate Rewards®. This is the perfect card for any travelers who also enjoy dining out. Cardholders earn 2x points on travel and dining at restaurants and 1 point per dollar spent on all other purchases worldwide. Chase Sapphire Preferred® Card cardholders who also hold a Chase Freedom®, Chase Freedom Unlimited® or any other card that utilizes the Ultimate Rewards® system can combine points in one bucket, meaning your points add up more quickly. This is one of the best cards for big spenders whose rewards can really add up. If you're a casual spender, the annual fee might be difficult to offset and you should consider a no-annual-fee card instead. The Chase Sapphire Preferred® Card upped its already excellent signup bonus offer – now you can earn 60,000 bonus points after spending $4,000 in the first three months; it's quite possibly the best value out there on a card with just a $95 annual fee. The opportunity to earn big upfront rewards is obvious with this card. The Chase Sapphire Preferred® Card has quickly become one of the most popular cards for CardRatings readers. The popularity stems from the ongoing value of this card: high rewards rates, no blackout dates, restrictions or expiration dates on rewards. Cardholders can even use their points to book a flight for someone else. Cardholders can also take advantage of an additional 25 percent value for travel when redeeming points through the Ultimate Rewards® program, allowing you to stretch your rewards even further. In order to take full advantage of the Chase Sapphire Preferred® Card, cardholders should spend more of their budget dining out than grocery shopping. Grocery shopping will only earn a cardholder one point per $1 versus the two points per $1 for dining out. For grocery spending, there are better offers, such as Blue Cash Preferred® Card from American Express which offers 6 percent cash back at U.S. supermarkets throughout the year (up to $6,000 annually). Savvy spenders get both cards and use them in the respective categories that earn them the most. Also, cardholders will need to use their card regularly. The $95 annual fee can be offset with a few trips booked each year, but those that do not use their credit card for categories which earn the most points will have a hard time offsetting the annual fee. If this is you, you should consider a card such as the Wells Fargo Cash Wise Visa® Card which has no annual fee. If you prefer to travel with loyalty programs outside of the named partners, the Chase Sapphire Preferred® Card may feel limiting to you even though you can use your points to book with any airline – you just can't transfer points to any airline and take advantage of possibly lower redemption rates. Chase Sapphire Preferred® Card and Capital One® Venture® Rewards Credit Card both have solid bonus opportunities for new cardholders, though for a slightly higher spending threshold Chase Sapphire Preferred® Card earn 60,000 points, which is worth up to $250 more than the Capital One® Venture® Rewards Credit Card welcome offer. The Capital One® Venture® Rewards Credit Card offers 50,000 bonus miles – worth $500 – after you spend $3,000 in the first three months. 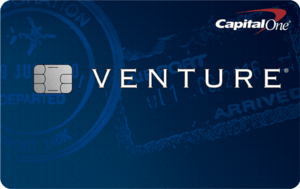 The Capital One® Venture® Rewards Credit Card, however, does waive its annual fee for the first year before going to $95. The big difference between these two is that you earn two times the miles on all your purchases with the Capital One® Venture® Rewards Credit Card (plus 10 miles per $1 spent when paying for your stay through Hotels.com/Venture) as compared to two times the points on travel and dining out only with the Chase Sapphire Preferred® Card. Chase Ultimate Rewards® points are transferable to a number of airline and hotel loyalty programs and so are Capital One® Venture® Rewards Credit Card miles, though to different partners than with the Chase card. With the Capital One® Venture® Rewards Credit Card, you can fly any airline, stay at any hotel, anytime and not have to worry about blackout dates. Plus, you can transfer your miles to over 12 leading travel loyalty programs. Those points might be valuable to you if you have some travel loyalties. Additionally, Chase Ultimate Rewards® points are worth 25 percent more when you redeem them for travel through the Chase portal. 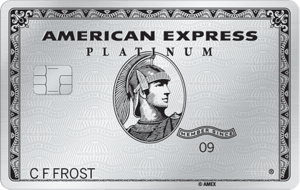 The $550 annual fee assessed on The Platinum Card® from American Express (American Express is a CardRatings advertiser) automatically narrows the group of card users who would take enough advantage of the perks to offset that fee (Terms apply. See Rates and Fees). Taking a deeper look into The Platinum Card® from American Express shows some unique benefits that make this card a bit pricey, but possibly a great option for the right cardholder. Cardholders can earn a $200 airline fee credit each year when incidental fees are charged by a pre-selected airline and can receive a statement credit every four years to reimburse Global Entry or TSA Pre✓™ application fees. The Chase Sapphire Preferred® Card has a much lower annual fee, but lacks some of the elite perks of The Platinum Card® from American Express. The Chase Sapphire Preferred® Card continues to measure up fairly well when comparing its intro offer against other cards, but there are similar options. The Barclaycard Arrival Plus® World Elite Mastercard® offers 70,000 bonus miles to new cardholders after $5,000 in purchases within the first 90 days of account opening; 70,000 is worth $700 in travel statement credit, as opposed to the chance to earn 60,000 bonus points, or $750 toward travel, with the Chase Sapphire Preferred® Card. Also, with Barclaycard Arrival Plus® World Elite Mastercard®, you receive 5 percent of your miles back – that means 3,500 miles, worth $35, if you redeem the full 70,000-mile intro bonus – each time you redeem your miles with the Barclaycard (See Rates and Fees). The Barclaycard Arrival Plus® World Elite Mastercard® also earns some brownie points with its general spending categories. Each purchase made with the Barclaycard Arrival Plus® World Elite Mastercard® is worth two times the miles, which is slightly more appealing than the Chase Sapphire Preferred® Card rewards categories. Who Should Get the Chase Sapphire Preferred® Card? The Chase Sapphire Preferred® Card appeals to travelers who spend regularly on their wanderlust and dining excursions. Given the modest annual fee and the high reward value opportunity with your points, you really don't have to be a frequent traveler to benefit from this card, though. A trip or two each year, along with regular card usage, should more than offset the fee. And let's not overlook that stellar signup bonus worth up to $750. With no foreign transaction fees, this card can pay for itself with just one overseas trip. Adding double points on travel and dining purchases to the mix can help you rack up even more free rewards. Cardholders that also have a Chase Freedom® card, or other Ultimate Rewards® card, should use these credit cards in unison to maximize rewards. 2 Miles per dollar on every purchase, every day. Applied Chase Sapphire card to them, was told that they need me to fax my driver's license and SSN to them. I faxed to them immediately but they said the fax was too vague for them to see. So I had to fax them again several times, but every time they just couldn't read them because of document was too dark or too light. I faxed them through my office, online and even Chase branches. And got rejected notice with message 'information is not sufficient'. Chase, you like having fun on people right?